Coming straight off the back of its announcement of a new Mario movie, Nintendo had another crowd pleasing reveal to tweet out yesterday, one which Mario Kart fans will be happy to hear about. The company lifted the lid on its next “new mobile application in development”, and it's called Mario Kart Tour. Yep, Mario Kart for mobile is finally coming, meaning you’ll be slip-streaming and turbo drifting from the comfort of your phone by the end of the fiscal year. Nintendo wasn’t able to say too much about the project, but it did reveal the logo for the game in its announcement tweet, which you can see for yourself below. From the sounds of it, Mario Kart Tour has only just begun its development, and Nintendo stated that it plans to release the game “in the fiscal year ending in March 2019”, which is a fairly vague launch window to get excited about. That means you should stick to Animal Crossing: Pocket Camp and Super Mario Run for your Nintendo mobile fix for the time being, but it’s still fun to postulate how Mario Kart Tour might play on our cellular handhelds. 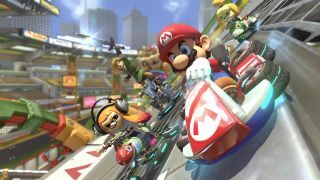 Given how previous Nintendo mobile games have worked, I’d expect something that very much looked and sounded like Mario Kart as we know and love it, but dialled down to complement the hardware and designed to allow players to spend real money on their karts and characters if they so choose. If Nintendo knows what's good for it, it’ll surely cater the game for easy on-the-go multiplayer, and I’m sure we can expect some form of tilt controls to play their part too. The real question is whether this news should be taken as confirmation that a proper new Mario Kart game for Nintendo Switch isn’t currently in the works. Mario Kart 8 Deluxe is more than enough for now, but it remains to be seen whether Mario Kart Tour is going to scratch that karting itch beyond those first few months after launch. What are your thought on Mario Kart Tour? Excited? Worried? Not bothered? Let us know in the comments below.